I explained the first method of preliminary load calculations; Space by space (functional area method) in the previous topic " Electrical Load Estimation – Part Two ". Also, I explained the second method; Building Area method in the previous topic " Electrical Load Estimation – Part Three “. Today, I will explain the third method for electrical load estimations which is Area method. Area method is used for Area loads which consist of groups of individual building loads that be constructed on a large area and will be served by a same subdivision of the electric distribution system. 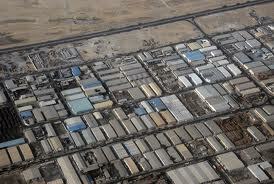 Examples for cases where area loads method will be applied are industrial, residential, commercial and military areas. The area method will be used for the design of substations serving these areas. Groups of individual building loads within an area. Optional method (Load center method). Step #1: list the buildings names included in the area and determine the numbers of identical buildings. Step#2: calculate the total connected load for each building by using the one or both of the previous methods; Space by Space and building area. Step#3: determine the classification of each building from table #1. Step#4: determine the demand factor for each building from table #1. 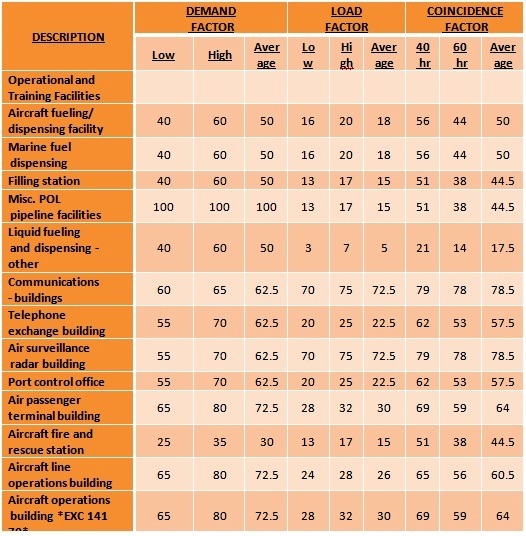 Step# 5: determine the load factor for each building from table #1. Step# 6: find the coincidence factor for each building from table #1. Step# 9: calculate the general loads for this area which include roadway lighting, area lighting, obstruction lighting, and other loads not included in individual building loads. you can download table#1 by clicking Here. Steps from #1 to #7 are the same as in basic method. Step# 8: an additional coincidence factors – differs from that given in Table# 1 - will be applied to each load center which can be called as “load center coincidence factor”. After determination of load center coincidence factor for each load center, the total building demand = ∑ (All load centers demands). Steps from #9 to # 11 are the same as in basic method. For loads of a similar nature, it should be in the range 0.93 to 1.00. For loads of a varying nature (Evening loads and daytime loads) are combined; it should be in the range of 0.70 to 1.00. The lower values will occur when the magnitudes of the loads are nearly balanced, and the higher ones when the combined load is predominantly one type. Calculate the main electrical service size for this area using the building connected loads indicated above. You can download an excel worksheet for preliminary load calculation as per area method b y clicking Here. A system loss of approximately 6 %, based on calculated maximum demand, should be added to the preliminary building load. Determine the requirements for load growth for anticipated usage and life expectancy with particular attention to the possibility of adding heavy loads in the form of air conditioning, electric heating, electric data processing, and electronic communication equipment. No more than 10% spare capacity will be considered during design unless otherwise noted. In the next topics, I will explain how to design and draw an optimal single line diagram. So, please keep following.